The paper uses the idea of branch shortening to infer dates for the mtDNA phylogeny. Briefly, if one counts differences between a present-day sample P and an ancient sample A, one can get a sense of when their most recent common ancestor X, lived. But PX and PA are not equal: PA is shorter, because A has "missed" a few thousand years of evolution (depending on its age). If we know the age of A (and this can be reliably known by direct dating for many samples), then we can infer the time of X. 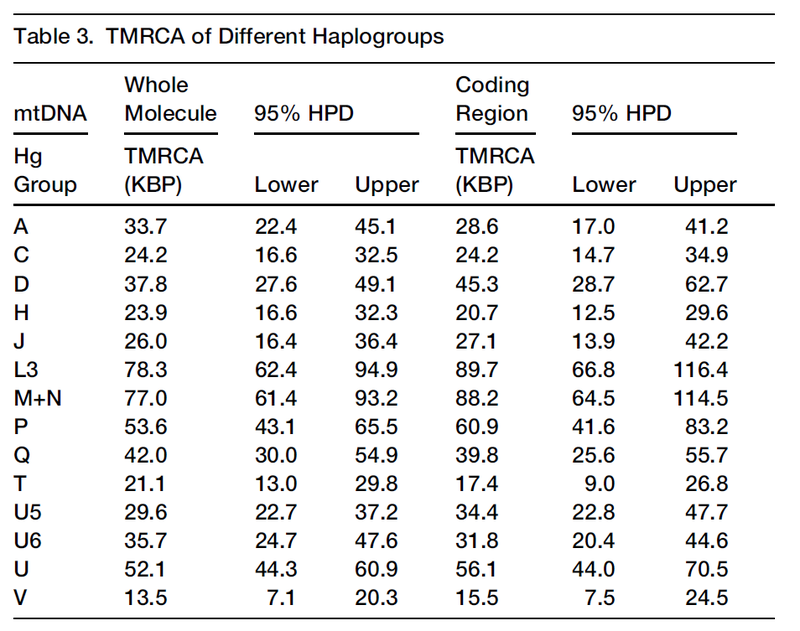 Looking at the ages of many haplogroups, I don't see any that immediately strike me as inconsistent with recent published age estimates based on modern mtDNA alone, such as those from the Copernican reassessment paper. In any case, this is an exciting new application of an idea that will yield good dates for haplogroup ages in the future. For example, it could be used to date Y-chromosome lineages as well, when high-quality sequences of ancient human Y-chromosomes become available. Please note that the "Cro Magnon" sample is actually revealed to be non-ancient in the study; that is another utility of the "branch shortening" idea, since it can demonstrate that purported very old samples are in fact fairly recent. Note the important new samples from Dolni Vestonice, Oberkassel, Continenza, all of which are Paleolithic Europeans and all of which belong, without exception to subgroups of haplogroup U. It appears that Europe was indeed dominated by this haplogroup down to Mesolithic times, with a sharp discontinuity with early Neolithic Europeans. Using this criterion, we excluded Paglicci Str. 4b from further analysis as the rate of C to T misincorporation at the 50 end was only 8.8%, thus making an ancient origin for the DNA in this sample uncertain . Personally, I doubt there was any mtDNA haplogroup H in pre-Neolithic Europe, as the first author of this paper has also argued for in a previous one. 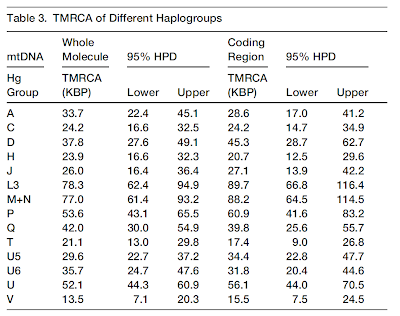 There is also a new sample from Boshan; it is probably too early to detect a pattern, but it is nonetheless noteworthy that it also belonged to mtDNA haplogroup B like the much earlier sample from Tianyuan. Finally, the paper also discusses the issue of the mutation rate, noting that the divergence between Eurasian (M+N) and African (L3) mtDNA is much later than that inferred for autosomal DNA using new and "slow" de novo autosomal mutation rates. In my opinion there are two possible interpretations for this: one that there's something wrong with the slow rates, while another is that the earlier divergence using autosomal DNA may be a consequence of inflation due to admixture events in Africa. "Personally, I doubt there was any mtDNA haplogroup H in pre-Neolithic Europe, as the first author of this paper has also argued for in a previous one." Did you forget about the presence of H in pre-Neolithic NE Europe. Moreover just because they excluded Paglicci Str. 4b from the analysis it doesn't mean that it isn't the actual haplogroup. Give it up Dienekes! It is well known that mt-DNA U dominated pre-Neolithic Europe, however, haplogroup H has made more than a few appearances already, it is only you who keeps insisting that it isn't there. All have turned up mt-DNA H.
Moreover just because they excluded Paglicci Str. 4b from the analysis it doesn't mean that it isn't the actual haplogroup. The question isn't whether it is "the actual haplogroup" but whether the sample is really ancient. It's possible for some clades of H to have arrived in Europe in the late pre-Neolithic phase, but certainly it's clear by now that Paleolithic Europeans were almost exclusively a U-bearing population that was eventually largely replaced during the Neolithic and post-Neolithic periods. Also what does do they mean with the whole Cro-Magnon being only 690 ybp old? Does that mean that the Cro-Magnon is only 690 ybp old, and that all Carbon datings thus far have been incorrect, or am I missing something here? "Does that mean that the Cro-Magnon is only 690 ybp old, and that all Carbon datings thus far have been incorrect, or am I missing something here?" "All but one of the ancient modern human sequences from Europe belonged to mtDNA hg U, thus confirming previous findings that hg U was the dominant type of mtDNA before the spread of agriculture into Europe. The exception was the Cro-Magnon 1 sample, which belonged to the derived hg T2b1, an unexpected hg given its putative age of 30,000 years. Since the radiocarbon date for this specimen was obtained from an associated shell, we dated the sample itself using accelerator mass spectrometry (AMS). Surprisingly, the sample had a much younger age of about 700 years, suggesting a medieval origin. Consequently, this bone fragment has now been removed from the Cro-Magnon collection at the Musee de l’Homme in Paris." "Please note that the "Cro Magnon" sample is actually revealed to be non-ancient in the study; that is another utility of the "branch shortening" idea, since it can demonstrate that purported very old samples are in fact fairly recent." So this new mutation rate of 2.16 – 3.16 E-08, is 42-74% faster than the Soares mutation rate of 1.52 – 1.81 E-08, which was used to estimate the date of the L3 node using multiple whole mtDNA sequences from East Africa to after the toba super-eruption, or slightly close to it, in Soares (2011) . If these new, and by far the most reliable mutation rates thus far, were then applied to estimate the L3 node in those same Soares (2011) samples, then it would stand to reason that the L3 node would be even more younger than what was originally estimated in that paper, making an even more clearer case for a post-toba migration of all non-Africans. I think what this paper has done in effect is to kill any type of glimmering hope for a continuity scenario either from the dubious qafzeh skeletal remains, the phantom people that may have created and used those technologies in Dohfar, and off-course that shady mandible found in china. @jeanohizun, it probably means fraud. Question to me is which ones are fake and how long til they all get recognized. According to hawks the earliest cro mag is now around 25k. Taking the A00 to mean there's a slower mutation rate is rather eye rolling. There's no reason to think any piece of DNA suddenly appeared at 200k years ago in the first place. All the math they use assumes a distribution model and assumes that it appeared at certain times. You just can't assume either of those things, and there's good reason not to (they have both been disproven, by age of A00 and by study showing Y chromosome is selected on). But 'modern' humans could have easily all had A00, you can't really know. Or they could have gotten A00 from early neanderthal admixture by the r1bs in cameroon who moved there in ancient times after admixing with neanderthal. Seems like lots of people agree these days but I don't see how sub saharan africa can be the big origin of anything. It's just too remote and separate from everything else. Because people looked modern doesn't mean that's where the important things developed. Heidelbergensis was found in europe 200k before africa. Obviously at least some gene flow came out of there. It just makes sense that europe is where most the evolution took place. You'd never evolve bipedalism in the sevannah. Why don't the chimps? They need that speed to evade predators. Bipedalism was actually a big failure in the sevannah a long time. Death rates for early homo was much higher than for chimps. OTOH a knuckledragger in cold weather makes perfect sense. Energy savings is important in tundra but more obviously you'd freeze to death. Oldest art is in europe as well, much sooner than ME let alone africa. It seems to me most of what's taken for granted is just fantasy. L3 and N+M seem very young in these results - even the upper end of the estimates (<95 ky) is not compatible with Levantine and Arabian populations. But at least, the center age of ~78 ky supports a pre-Toba S/SE Asian population and a migration towards and inside Asia before the climate turn cold and dry (~70 ky). The sample in question was only one fragment from the "Cro-Magnon collection at the Musée de l’Homme in Paris" - so, evidently, it was just wrongly placed into the collection (based on a 30 ky date of an associated shell, not direct dating). If these new, and by far the most reliable mutation rates thus far, were then applied to estimate the L3 node in those same Soares (2011) samples, then it would stand to reason that the L3 node would be even more younger than what was originally estimated in that paper, making an even more clearer case for a post-toba migration of all non-Africans. Not sure what you're talking about. Soares et al. (2011) estimate the age of L3 as ~70ka, and this paper at ~78KBP. Nothing in this paper made L3 "younger" or much "older". I am saying that if Soares (2011) used the more reliable mutation rates from this new paper, which are significantly faster than the rates used in the original paper (which rates come from Soares (2009)), then the L3 node estimate will likely be even more younger than 70KYA for the central estimate. So, are you saying that there's something wrong with this paper's methodology that makes L3 be 78KBP old? Not sure why you'd want to mix and match this paper and that to arrive at an earlier date than both. I am not saying there is something wrong, rather more precision could be gained since the modern samples from the Soares (2011) paper were qualitatively more superior for estimating the time to the L3 node than the samples in this paper, while the mutation rates in this paper are superior, since it is calibrated with actual pre-historic mtDNA sequences, than those used in Soares (2011). "But 'modern' humans could have easily all had A00, you can't really know. Or they could have gotten A00 from early neanderthal admixture by the r1bs in cameroon who moved there in ancient times after admixing with neanderthal". Or A00 could be exactly what it seems: closely related to the ancestor of modern human haplogroups. Modern human haplogroups must have come from some pre-modern population. As you say, 'There's no reason to think any piece of DNA suddenly appeared at 200k years ago in the first place'. "You'd never evolve bipedalism in the sevannah. Why don't the chimps?" Bipedalism would have been a huge advantage on the savannah. Chimps ar enot savannah creatures. They stick to more forested zones although perhaps not as heavily forested as do gorillas. Which art is it, what is older than any found in the Middle East? @terryt: "Bipedalism would have been a huge advantage on the savannah." Very much so. I remember Louis Leakey stating that man was a walking animal. It is probably our greatest adaptation. Bipedalism is enormously efficient. A man can literally walk-down a gazelle or the like and kill it with a rock. John Hawks has some unusual views (such as, heidelbergensis does not exist as a valid category) - but even he surely does not believe this any longer. Yes, before ~40,000 ya finds are sparse (probably reflecting an initially spare population density), but the vast majority of researchers identify the Bohunician, proto-Aurignacian, early Kostenki and early Aurignacian industries with AMHs. This is not only based on typical UP features, but also association with Ahmarian, Uluzzian, and Kostenki 1, for which there are skeletal remains. Yes, some have some archaic features - but that is to be expected, and they are still clearly AMH. My gut instinct, comparing those dates (which are shorter, often despite archaeological evidence that is suggestive of older dates) and dates estimated using earlier methodds, is that there is something methodological in the assumptions going into this paper's dates that is wrong. While I can't point my finger at a particular shortfalling, the kinds of problems I could imagine and look for, would include, for example, underestimating diversity at any given point in time and omitting probabilities related to lineages that went extinct without reaching contemporary times (whereas in contemporary samples, all lineages sampled ipso facto survived to the present time without going extinct entirely). Age estimates from modern samples are essentially immune to these kinds of issues dating methods for contemporary samples may make assumptions like these that don't hold for ancient DNA without rigorously identifying those assumptions because they haven't normally seemed to make a difference in contemporary population genetic studies. I am even more skeptical that the studies are accurately establishing date error bars that take into account uncertainties in this methodology that aren't present in conventional population genetic dating. "While I can't point my finger at a particular shortfalling"
"Age estimates from modern samples are essentially immune to these kinds of issues"
My feeling is that haplogroups do not obey any sort of 'half-life' system. Survival is a matter of randomness, especially where popualtion numbers remain basically constant. In other words 'offspring' haplogroups do not replace 'parent' haplogroups in a systematic way. But where survival is almost 100%, or population is expanding in numbers exponentially, all offspring haplogroups survive and we have a regular mutation rate. As a result of all this I doubt we will ever come up with a reliable 'mutation rate' for ancient haplogroup replacement. He doesn't really draw any conclusion, but at the same time it seems like a big mystery with lots of missing pieces that bipedalism would devolp in that environment. I find it interesting that the hominid ancestors of man suffered huge casualties compared to chimpanzees in the same environment. Remember of course, neanderthals were not the best runners, and earlier hominids even worse. So while the modern upright walk is possibly an advantage on the sevannah (which is the biggest argument for its evolution) that doesn't seem to make much sense. Being a slow walker is a death sentence in that environment, which the fossil record shows, making me think it came about for another reason. The biggest to come to mind are cold and efficieny, which of course are going to matter further up north. Also, we know there were AMH before 25k years ago for sure, but where they were is the question. Now they are pushed out of france which technically should be the only ones called cro-magnon. I think it's pushing it to credit the aurignacian to neanderthals but at the same time it's clear that AMH got stone tools from neandethals not the other way around. Seems very likely as someone (you?) put it there was "hybrid vigor" involved when the neanderthals got absorbed as that's when the real culture seemed to take off. I'll also be interested to see those AMH bones sequenced and see what level of neanderthal admixture there is, especially with examples around 25K that seem to show both. And how it relates back to the point is you can't make these big assumptions and build a giant chain of them and then apply math that is just backfilling your assumption. Yes it could be just like they say. It could be that evolution in africa became secondary a million years ago and the bulk of it happened in europe or anatolia or possibly even in some sunken areas off the coast of india - there does seem to be a huge migration from that area for a long time at the very least, though I don't give that idea too much weight. Because we find something to be older probably means it's in a more isolated area, not that it's the place of origin or the most active evolution. For example, the basques. No one thinks they are the origin point of basque language and things like negative blood types. It's just a guess and one which is made meaningless by very dint of the fact we have much older DNA floating around, and should be treated as that. At best it's only of use to look at relative ages, and only as an estimate. Such as finding that cro magnon fake. Oh, and forgot to say, partly or mostly wooded was also the environment of hominids before around a million years ago, not sevannah. We also have have no evidence they used tools or had tool adaptations before then. But then we also mysteriously have NO fossil record for chimpanzee predecessors, either. I am not a creationist but there's an awful lot of questions they raise that make me think, hey, maybe some or all of these earlier hominids aren't human precursors at all but chimp precursors. None of them can be pointed to as 100% upright, but more likely knuckle draggers like chimps then suddenly a fully formed biped foot and lots of other sudden changes. Sorry, it's gone far afield now, but I think there is a big pattern of assumptions based on convenience samples and wishful thinking in anthropology. If humans evolved from aquatic apes or in dense jungle areas there'd simply be no fossils at all for that portion of time. Definitely older than ME art. It seems that the art radiates outword from iberia just like musterian culture, which also came from neanderthals and spread to AMHs (maybe hybrids?). Oldest in ME, I think, is close to 10k years apart. Again going back to aurignacian, hawks seems to think it is neanderthal but I don't think there's evidence of that DIRECTLY. But now we do know things like this, lascoux, the lion man, all that had to have been neanderthal since the cro magnon stuff was fake. So I would not be surprised, especially as the AMH dates get pushed forward in western europe, neanderthal push forward as well, and age of the culture keeps getting pushed back. I kind of favor the "hybrid vigor" myself. AMH from ME mix with neanderthals and get the most important stuff of each and BAM a renaissance of acient art and tools. Sorry for double (triple!) post but I didn't see the comment before now. I agree with you. Today, existing lines have a huge range of branch lengths. With the few ancient data point, we clearly only see something close to mid-value but randomly and non-randomly biased. These things tend to be non-linear, thus having a large impact on averages. For example, some of the data samples are from periods of extremely small population sizes and during geographic isolation, but just after some major population explosions (~50,000 ya in S/SE Asia, and again ~40,000 (Aurignacian) and during the Gravettian. You would expect strong selection effects and thus preference for very recent adaptations and the "culling" of "outdated" ancient lines. For example, Tianyuan you would expect short, and in deed it is - quite a bit shorter than Kostenki or Dolni Vestonice - which are similar in branch length to several extant populations. On the other hand, Oberkassel, following post-LGM expansion, again shows relatively short length for the time. "Today, existing lines have a huge range of branch lengths". That alone should make us suspicious of any 'mutation rate'. "Seems very likely as someone (you?) put it there was 'hybrid vigor' involved when the neanderthals got absorbed as that's when the real culture seemed to take off". I think that was me, although Eurologist may agree. "But then we also mysteriously have NO fossil record for chimpanzee predecessors, either". Possibly because chimpanzees evolved in a wetter, much more forested, environment where fossil formation is much less frequent. However I do agree with, 'partly or mostly wooded was also the environment of hominids before around a million years ago'. And probably more recently too. In fact I suspect their movement out of Africa was from one clump of trees to the next clump. Once they had eliminated any leopards from the home clump they would have been a lot safer. "maybe some or all of these earlier hominids aren't human precursors at all but chimp precursors". I am suspicious that Sahelanthropus tchadensis is ancestor to both. "None of them can be pointed to as 100% upright, but more likely knuckle draggers like chimps then suddenly a fully formed biped foot and lots of other sudden changes". The change is not as abrupt as you imagine. Several species appear to be basically upright but still with an efficient tree-climbing ability. That holds especially for the species 'Lucy' represents. "But now we do know things like this, lascoux, the lion man, all that had to have been neanderthal since the cro magnon stuff was fake". I don't think your conclusion is correct at all. Not all the 'cro magnon stuff ' is fake. But now we do know things like this, lascoux, the lion man, all that had to have been neanderthal since the cro magnon stuff was fake. One wrongly-placed bone fragment does not completely change our picture of the AMH time line in Europe. Just take a look at the list I compiled above. That's all from peer-reviewed literature, and most of it rather recent. There is absolutely no question: AMHs entered Europe with a culture similar to ~contemporaneous Levantines and Anatolians ~45,000 -43,000 ya, and while the first ones were likely largely male-dominated hunting bands taking advantage of the "low hanging fruit" (hunting animals that did not have an instinctive threat mechanism evolved towards them, due to differences w/r to Neanderthals), AMHs became pretty much dominant in just ~3,000-5,000 years with a wide population spread ~40,000 ya. I am certain AMHs benefited from Neanderthal genes in many ways, including health, coping with colder and darker environments, and some intellectual capabilities Neanderthals developed in those environments. I wouldn't call that "hybrid vigor," though. eurologist - The COMPLETE lack of 'cro-magnon' in cro magnon is what matters. There's AMH in arabia and africa at that time but it has no bearing on france, does it. You also have more recent neanderthals than the AMH you speak of. You are talking about central europe and ME not West Europe which is where auregnacian and gravetian radiate out from. And here's neanderthals as recent as 25k years ago. There's no question AMH were encroaching on neanderthal territory by then but they weren't close to sites like lascoux or chavet, they got there at least 10k years later. Skeleton is BURIED in between two levels of culture. So which culture was it from? Even worse than the lack of basic history knowledge I see for more modern anthropology, how do you fail at common sense like this? Obviously if you BURIED it then you dug to something lower to do so. Unless they think it was exposed for thousands of years while people heaped trash on it. This one is 36k bp, but it's a little more north and east. So at this point you have possible AMH in other parts of europe but the neanderthal is still alive and kicking in france, which is the place that matters for dating all the artifacts, earliest art, etc. Here we have what looks like a hybrid at 24.5 k years ago. So if these dates are good (or at least good into relation of other dates) looks like the gorham caves probably were just around the last gasp of pure neanderthals, but 10k years later it was still all pure neanderthals in france and iberia, which are really where the auregnacian artifacts that matter come from. Interestingly it's immediately after this or just before it that gravetian culture starts up. There were no AMH in britain at this point, pretty certain. Even if aregnacian was wholly AMH, Uluzzian was not, and included arrow points which were previously thought to be AMH only. You are talking about central europe and ME not West Europe which is where auregnacian and gravetian radiate out from. Neither Aurignacian nor Gravettian radiated out from France. Early Aurignacian has very-well documented connections to the northern Levant and Anatolia - as excepted from a route from Afghanistan/Pakistan/NW India south of The Two Great Lakes. Early Gravettian has connections to the Crimean, as expected for a route through and connection with natives from the plains, and an additional connection with East Asia that is apparent in autosomal DNA. France and Iberia were the recipients of advanced cultures 45,000 to ~30,000 ya from the east, as evident from the intermediate cultures in central Europe and nowadays Germany (see e.g., Venus of Hohle Fels, Hohlenstein-Stadel Lioness, Hohle Fels and Vogelherd flutes, etc.). I suggest you try reading original literature, especially from the past decade, or so.